Since creating this blog, I have had the pleasure of meeting and befriending some truly wonderful people, which for me is the biggest joy that comes from being a Tolkien fan and blogger. One such new friend is Julianne Snyder, a Philadelphia-based abstract artist. 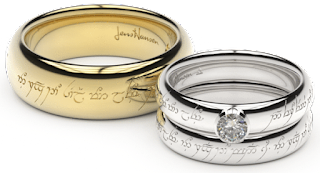 I first met Julianne back in July after she asked me to help translate a phrase into Sindarin for a ring she was creating. When I noticed how amazing her artwork was – and that some of them were even inspired by Tolkien – I knew I had to share it. Juli very kindly agreed to answer some questions for me, and provided some very thorough and heartfelt responses. When/how did you get started? I first started painting in 2000, my first year of college at Temple in Philly. 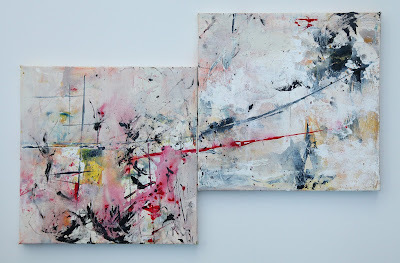 I had a couple great painting teachers, but the one I most connected with was an extraordinary abstract painter. He was a Vietnam vet, with such a blunt, honest realness about him, and I greatly admired him. I always hated still lifes and working from a model, and I'd get so frustrated and angry because I could never get it to look exactly as it was! No matter how many times I'd go back into the piece, I was never satisfied. One day he told me to just do my own work, rather than tear my hair out over whatever wretched still life we were supposed to be painting, and that changed everything for me. How would you define "art"? I suppose I'd define art as anything one does that creatively expresses one's self. If it gets what you're feeling out there, that's incredibly important, and very powerful. If you feel inclined to do something creative, please don't ignore it! Nurture it! You have nothing to lose and so much to gain! Follow what your heart wants, even if you don't understand why you're drawn to certain things. Try out mosaics, take a stained-glass class or a knitting class! You feel empowered when you create art. There's a piece of you in everything you create. What medium/techniques do you use? I use acrylic paint mostly and some mixed media. Acrylic colors are really vibrant, quick drying, and you can mix so many other things into the paint to alter the texture and fluidity. Texture is something that always excited me. Whenever I'd look at artwork, I'd always want to get super close to the thing and even touch it, if I was allowed! It's fascinating. I love seeing the foundation, the layers and 'mistakes'. I paint primarily with pallette knives, brushes and recently, with twisted up towel, but am open to using whatever is lying around! I've used forks, toothbrushes, sticks...I've found that in life, as well as in art, what you add to it is as important as what you take away. I'll often wipe off and re-paint many times til I'm satisfied with it. I like to work on multiple paintings at once too, so I don't obsess over one thing. How do you come up with new pieces? What is the process like? I usually have a different color palette I prefer during any particular period of time. Right now for example, I'm big into neutrals, metallics, earth tones; things I shied away from for the longest time. I'll put something good on Spotify or Pandora, and let my intuition and emotions guide me. It's extremely rare I go into a painting with something specific in mind, because it never turns out the way I'm envisioning it. Sometimes I'll decide on a couple colours I definitely want to use and let that shape everything else. Sometimes the hardest part of starting a new piece, is just picking up the brush or knife. What is your favourite piece that you've created? Oooh that's a toughie! I don't think I have a favourite one piece. Many of my paintings I feel a strong emotional attachment to due to whatever I had going on in my life at the time. Emotion is one of my main inspirations; I can't create without some very real emotion as the base. I just can't do it. I've tried. People have asked me why I can't just crank out more pieces with less time put into them, but I really can't. I'd probably have to go with these guys: Ultimatum, Time Will Tell, The Way Out Is Through and Sea In My Soul. Ultimatum is going to be in a private collection in L.A., Time Will Tell will be shown in the SOLO exhibit at the NY Art Expo in April 2014. The others I may never sell. Do you have a favourite artist or piece of artwork by someone else? Alan Lee's brilliant conceptualizations and meticulous attention to detail. The mastery and skill that comes from Weta; I'm totally blown away by what they do. Frida Kahlo's work is wild. Her story is somethin' else. She was a super tough lady who had a rough go of it; really inspirational. I saw her show at a museum a few years back in Philly, and I remember just standing in front of this massive self portrait she did called "The Two Fridas", and just staring for so long. I was so overwhelmed by the weight of this piece; the raw, honest emotion and the duality of it. I could've stood there for hours. Maxfield Parrish was born in Philadelphia; he was one of my first favourite artists. His style, use of light, fantasy subject matter and wildly vibrant colors always had an immense appeal to me. He even invented his own shade of blue! My dad introduced me to his work when I was younger. Thomas Cole was around in the 1800's and was part of the Romanticism movement. His work is mostly comprised of evocative landscapes, showcasing depth and light. The duality in his work I really connect with. The Fall, the movie directed by Tarsem Singh. This film is an absolute masterpiece; the visually arresting landscapes complement perfectly the characters' range of emotions and connections with each other. I consider this a work of true art and just surreal beauty. It was shot in more than 20 countries. This ranks up there with the Lord of the Rings movies, although I can't watch it often; it hits very close to home, emotionally. There is this incredible raw, real connection between the two main characters, one of which, before the creation of the film, spoke no English, so there had to be a genuine connection made for the dynamic to really work. I feel like my heart and soul just cracked open when I watch this. It's a serious heart-opener; symbolism, metaphor, mortality, love, and of course the classic battle of good and evil, both inside and outside of us all. So powerful. Lee Pace is another one I'd be totally honoured to meet. He's a phenomenal actor. I find inspiration in so many places! The biggest creative inspirations for me are emotions, clouds, nature, music... Music really lifts me. I don't remember the last time I painted without music, or listening to some kind of inspirational talk. If ever I'm stuck in indecision or if I start to doubt what I'm doing, I'll put something on that really draws out my emotion and evokes - The Lord of the Rings soundtracks, Lindsey Stirling's music, or a Viggo interview. Who isn't moved by "Concerning Hobbits", "May It Be", or Lindsey's Lord of the Rings Medley?! That Lord of the Rings video kills me - I remember watching and hearing it for the first time, and I was just in tears, totally overwhelmed and in total awe in my car! As far as people go, I'd say Marianne Williamson, who's this incredibly enlightened, gifted, spiritual leader. Rachel Benyola, who is the driven, strong female role model and mentor I wanted for so long and finally, this year, found. I'm so blessed to have her as a guide; she has changed my life exponentially for the better. These women have made the biggest creative impact on me thus far. I am a far better, far happier person with their influence in my life. They showed me there was a better way to be - that there are answers to the burning questions you're asking. It's like the saying goes, "When the student is ready, the teacher will come." They continue to assist me in my evolution as an artist, and as a person. Viggo Mortensen made a huge impact on me as well. I used to carry a piece of paper around with me that said, "What would Viggo do?" He is an excellent role model; incredibly dedicated, brimming with curiosity and creativity. I'm actually getting a portrait of Aragorn tattooed on me next year. 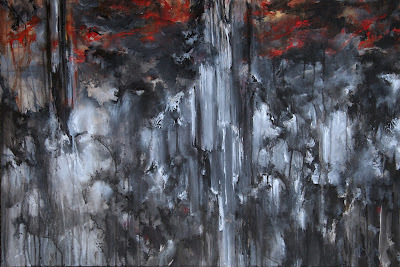 Juli's most recent piece, "Through Shadows"
For more of Julianne's incredible artwork, visit her website at http://www.juliannesnyderart.com. You can also follow her on Twitter and 'Like' her on Facebook. Thank you very much for sharing this. I have been waiting many years for a new [not necessarily abstract, but still] approach to Tolkien's work. Absolutely amazing - I love "For Gondor!"